It’s the Fourth of July in rural Todd and a colossal, blue, moon-faced, papier-mâché puppet is advancing down the road, arms outstretched with silky banners trailing behind. A crowd of several hundred dressed in artistically outlandish costumes follow, holding aloft paper birds and fish attached to bamboo poles. This fantastical scene is the Liberty Parade, the brainchild of painter, puppeteer, educator, rug designer, sculptor, and toymaker Martha Enzmann. Growing up in Minnesota, Enzmann was forever orchestrating magic shows and circuses in her backyard. Today, her friends from home aren’t surprised that she’s become a master of artistic spectacle. “It’s in my DNA,” she says. Enzmann’s journey from neighborhood impresario to sought-after parade designer brought her to Todd in 1996, when she and her husband, woodworker Tom Sternal, stumbled upon the abandoned Elkland Elementary School. Over the course of several years, they renovated the 1950s structure, turning it into the nonprofit Elkland Art Center, and began offering classes in painting, puppetry, and integrative art. Enzmann continued her own work, designing rugs under the moniker Elkland Handwerke and crafting a line of puppets and dolls called Todd Toys. Still, her interest in grand pageantry never waned. 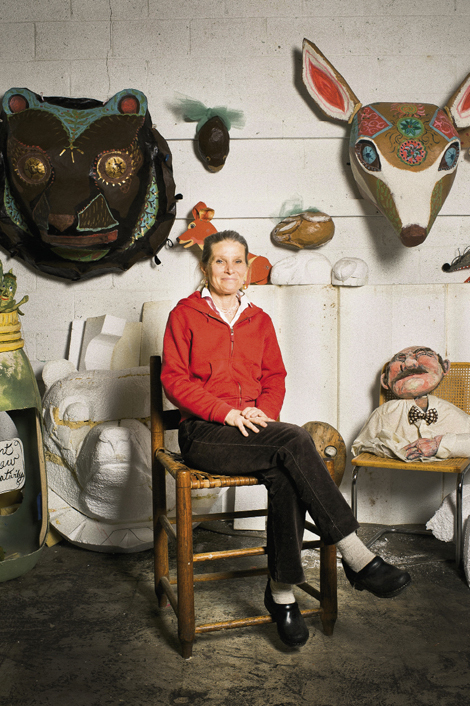 A visit to Minneapolis for the May Day Parade in 2000 spurred Enzmann to shift her creative focus, and that of the center’s, to parades and puppetry. That year, she and friends designed costumes and participated in Blowing Rock’s July Fourth parade. The following year, they launched the New River Parade and Flotilla in Todd. Enzmann has since been the creative force behind some 35 parades, including two in France. The Liberty Parade in Todd became so popular that she began offering workshops on parade and costume design in February. For details on parade workshops, visit www.elklandartcenter.org. The next session is May 18-20 at Elkland Art Center. Workshops for the July Fourth Liberty Parade will take place in Boone, Todd, and Ashe County on Saturdays in June. For more about Enzmann, visit www.elkland.com.